CD4+CD25+ T regulatory (Treg) cells were initially described for their ability to suppress autoimmune diseases in animal models. An emerging interest is the potential role of Treg cells in cancer development and progression because they have been shown to suppress antitumor immunity. In this study, CD4+CD25− T cells cultured in conditioned medium (CM) derived from tumor cells, RENCA or TRAMP-C2, possess similar characteristics as those of naturally occurring Treg cells, including expression of Foxp3, a crucial transcription factor of Treg cells, production of low levels of IL-2, high levels of IL-10 and TGF-β, and the ability to suppress CD4+CD25− T cell proliferation. Further investigation revealed a critical role of tumor-derived TGF-β in converting CD4+CD25− T cells into Treg cells because a neutralizing Ab against TGF-β, 1D11, completely abrogated the induction of Treg cells. CM from a nontumorigenic cell line, NRP-152, or irradiated tumor cells did not convert CD4+CD25− T cells to Treg cells because they produce low levels of TGF-β in CM. Finally, we observed a reduced tumor burden in animals receiving 1D11. The reduction in tumor burden correlated with a decrease in tumor-derived TGF-β. Treatment of 1D11 also reduced the conversion of CD4+ T cells into Treg cells and subsequent Treg cell-mediated suppression of antitumor immunity. In summary, we have demonstrated that tumor cells directly convert CD4+CD25− T cells to Treg cells through production of high levels of TGF-β, suggesting a possible mechanism through which tumor cells evade the immune system. A key aspect of tumor immunology is immune surveillance in the tumor-bearing host. It has been almost half a century since the concept of immune surveillance was first proposed by Burnet (1). This hypothesis has been debated and tested over the years. Despite the ability to generate immune reactivity against tumor Ags, the immune surveillance program can be overpowered by tumors with eventual tumor progression (2, 3, 4, 5). Tumor-infiltrating lymphocytes (TILs)2 were identified in both human and murine tumors and were shown to recognize and reject tumor cells in immunotherapy (4, 6). Despite their ability to infiltrate into tumor sites, the presence of TILs, however, is not always beneficial. Although a better prognosis in patients with elevated TILs has been observed in several studies, the mere presence of TILs is insufficient to reject tumors (7, 8, 9). Rather, the type of infiltrating cell is the essential factor in the rejection of the tumor (10, 11, 12, 13, 14, 15). Numerous studies have shown that CD4+ Th cells and CD8+ CTL are beneficial in antitumor immunity, whereas the presence of CD4+CD25+ T regulatory (Treg) cells is detrimental because the presence of Treg cells is associated with reduced survival (10, 11, 12, 13, 14, 15). CD4+CD25+ Treg cells are a unique lineage of the T cell population that regulates the immune system by inhibiting immune cell proliferation. In the 1970s, it was first proposed by Gershon and Kondo (53, 54) that T lymphocytes could function as helper cells as well as regulatory cells to suppress the immune response. In addition to suppressing CD4+ T cells and NK cells, Treg cells suppress activation and proliferation of CD8+ T cells (19). Treg cells inhibit target cells through a wide range of cytokines. Besides expressing TGF-β, Treg cells produce IL-10, and express CTLA-4, glucocorticoid-induced TNFR, and transcription factor Foxp3 (20, 21, 22). It is well established that Treg cells are a major player in the regulation of the immune system to prevent autoimmunity by suppressing harmful autoreactive immune cells (16, 17, 18, 23, 24). Recently, an emerging interest has been focused on the association between Treg cells and cancer development. These cells have been shown to suppress antitumor immunity, and depletion of Treg cells in vivo enhances antitumor immunity and facilitates tumor rejection (25, 26, 27, 28). There are at least two subsets of Treg cells. One subset, also known as naturally occurring Treg cells, develops during the normal process of T cell maturation in the thymus. The other subset develops as a consequence of activation of mature T cells under particular conditions in the periphery (28, 29). The negative regulatory role of Treg cells has been amply demonstrated, suggesting that the presence of Treg cells in the tumor microenvironment could indeed promote, instead of suppressing, tumor progression by inhibiting antitumor immunity (13, 14, 15, 30). However, the origin of these Treg cells in the tumor sites remains elusive. It is unknown whether they are naturally occurring Treg cells that are recruited to the tumor sites or whether they arrive at tumor sites originally as CD4+ Th cells that are later converted to Treg cells in the tumor microenvironment. Because the presence of Treg cells in the tumor sites is associated with poor prognosis in patients, identification of the origin of these cells will provide valuable information in treatment of cancer. In this study, we observed the tumor conversion of naive CD4+CD25− T cells into CD4+CD25+Foxp3+ Treg cells through the production of high levels of TGF-β. Furthermore, neutralization of TGF-β abrogated this conversion both in vitro and in vivo. Male C57BL/6 and BALB/c mice (6–8 wk of age; Harlan Sprague-Dawley) were maintained in pathogen-free facilities at the Center for Comparative Medicine at Northwestern University Feinberg School of Medicine in accordance with established guidelines of the Animal Care and Use Committee of Northwestern University. The mouse prostate tumor TRAMP-C2 cells were cultured in RPMI 1640 medium supplemented with 10% FBS and 1% penicillin/streptomycin (Invitrogen Life Technologies). The mouse renal cell carcinoma RENCA cells were cultured in DMEM supplemented with 10% FBS and 1% penicillin/streptomycin. The NRP-152 cells are nontumorigenic rat prostate epithelium cells and were cultured in DMEM supplemented with 10% FBS, 1% penicillin/streptomycin, 5 μg/ml insulin, and 0.1 μM dexamethasone. All cells were kept at 37°C/5% CO2. For studies with CM, CD4+CD25− and CD4+CD25+ T cells from adult mouse spleens were isolated using a mouse CD4+CD25+ T Regulatory Cell Isolation Kit, according to manufacturer’s instructions (Miltenyi Biotec). For coculturing studies, T cells were stained with rat anti-mouse CD4 and CD25 mAbs (BD Pharmingen) after coculturing with TRAMP-C2 or NRP-152 cells for 7 days and sorted on a FACS sorter into CD4+CD25+ and CD4+CD25− T cell populations. All purified T cells had a purity of ≥90%, as determined by FACS. CD4+CD25− T cells (4 × 106) were isolated from the spleen of adult C57BL/6 mice (Miltenyi Biotec) and cultured with TRAMP-C2 or NRP-152 cells (2 × 106) in the presence of 1 μg/ml rat anti-mouse anti-CD3 mAb (BD Pharmingen) and 3000 rad-irradiated, T cell-depleted splenocytes (1 × 107) as APCs for 7 days with replacing of TRAMP-C2 or NRP-152 cells every 2 days. T cells cultured in T cell medium with anti-CD3 Ab and APCs were used as a control. After the end of the 7-day culture, cells were sorted on a FACS sorter according to the cell surface CD25 expression into CD4+CD25+ and CD4+CD25− T cell populations. To determine the rate of conversion, isolated CD4+CD25− T cells were cocultured with TRAMP-C2, as described above, for 5 days. T cells were collected on each day and stained for CD4 and CD25 expression levels with Abs against CD4 and CD25 (BD Pharmingen) and analyzed by FACS. 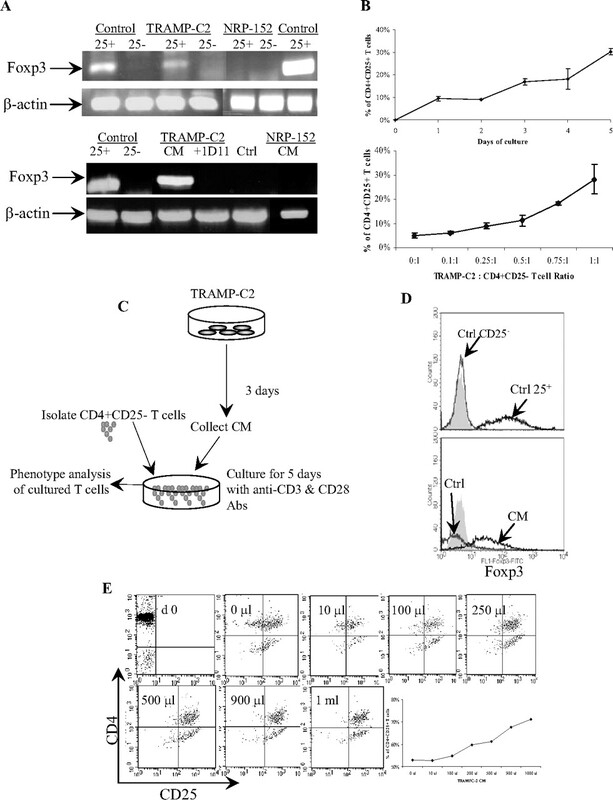 The effect of number of TRAMP-C2 cells on conversion was determined by coculturing TRAMP-C2 cells and isolated CD4+CD25− T cells at different ratios (0:1, 0.25:1, 0.5:1, 0.75:1, and 1:1) for 5 days. At the end point, T cells were collected and stained for cell surface expression levels of CD4 and CD25 (BD Pharmingen) and analyzed by FACS. Isolated CD4+CD25− T cells (1 × 106/well in 24-well plate; Miltenyi Biotec) were cultured either in complete T cell medium (RPMI 1640 supplemented with 10% FBS, 1% penicillin/streptomycin, 10 mM HEPES buffer, 10 mM nonessential amino acids, 1 mM sodium pyruvate, 4 mM l-glutamine, and 0.05 mM 2-ME) or in CM collected from a 3-day culture of RENCA, TRAMP-C2, NRP-152, or 20,000 rad-irradiated TRAMP-C2 cells in the presence of 1 μg/ml plate-bound anti-CD3 and 2 μg/ml soluble anti-CD28 Abs (BD Pharmingen) for 5 days. T cells cultured in T cell medium were used as a control. In some cases, a neutralizing Ab against TGF-β 1D11 (100 μg/ml; Genzyme) was added to CM to block TGF-β signaling. To determine the concentration of CM on conversion of CD4+CD25− to CD4+CD25+ T cells, 0.01, 0.1, 0.2, 0.5, and 0.9 ml of TRAMP-C2 CM were added to T cell medium in a final volume of 1 ml, and isolated CD4+CD25− T cells were cultured in diluted CM for 5 days, as described above. Five days later, T cells were collected and stained for cell surface CD4 and CD25 expression levels (BD Pharmingen) and analyzed by FACS. To detect Foxp3 expression, total RNA was extracted from T cells cultured under various conditions using a QiaEasy RNA Isolation Kit (Qiagen). A two-step RT-PCR was performed by first reverse transcribing RNA to cDNA using a First-Strand DNA Synthesis Kit (Invitrogen Life Technologies), and then PCR was conducted using Foxp3-specific primers, as described previously (22). To detect Foxp3 protein levels, T cells were stained using a Foxp3-specific mAb, according to the manufacturer’s instructions (eBioscience). Briefly, cells were fixed and permeablized in Fix/Perm Buffer and incubated overnight in the dark at 4°C. The next day, an Fc block (BD Pharmingen) was used to block the nonspecific binding before adding Fopx3 Ab, and cells were incubated in the dark at 4°C for 30 min. A rat IgG2a FITC Ab was used as an isotype control. Cells were then washed and analyzed by FACS. Isolated CD4+CD25− T cells were cultured with or without TRAMP-C2 CM. Five days later, they were collected, washed extensively, plated at a density of 1 × 105/well in a U-bottom 96-well plate, and restimulated with 1 μg/ml plate-bound anti-CD3 and 2 μg/ml soluble anti-CD28 Abs (BD Pharmingen) for 48 h (for IL-2 and IL-10 assays) or 72 h (TGF-β assay). ELISA were performed to measure the cytokine levels in the cell-free supernatant, according to manufacturers’ instructions (IL-2, IL-10 ELISA, BioSource International; TGF-β ELISA, R&D Systems). For TGF-β ELISA, serum-free medium was used. To measure TGF-β production in CM of various cell lines, all cells were plated at a density of 1 × 106/T-25 flask and cultured in serum-free medium for 48 h. Cell-free supernatant was collected and TGF-β production was measured using a TGF-β ELISA kit, according to the manufacturer’s instructions (R&D Systems). To detect TGF-β production in CM from irradiated TRAMP-C2 cells, TRAMP-C2 cells were irradiated (20,000 rad) and cultured in serum-free T cell medium (lacking 10% FBS) for 48 h, and CM was collected for TGF-β ELISA. T cells (5 × 104) from various culture conditions were cultured with freshly isolated CD4+CD25− T cells (5 × 104 or 1.5 × 104) from spleens of wild-type mice in the presence of 0.5 μg/ml anti-CD3 Ab (BD Pharmingen) and 3000 rad-irradiated, T cell-depleted splenocytes (5 × 104) for 72 h in a 96-well U-bottom plate. During the last 6–18 h, 1 μCi/well [3H]thymidine (Amersham Biosciences) was added to the culture. Cells were harvested and counted in a scintillation counter. For the titration assay, CD4+CD25− T cells were cultured with TRAMP-C2 CM for 5 days. Five days later, T cells were collected and cultured at various concentrations with CD4+CD25− T cells (5 × 104) for suppression assays. For the in vivo study, 1.5 × 104/well CD4+CD25+ T cells isolated from lung tissues were used. C57BL/6 mice were injected i.v. via tail vein with 1 × 106 TRAMP-C2 cells. Thirty days later, animals were sacrificed and lung tissue was fixed in formalin and cut into 4-μm sections for immunofluorescence staining. CD4 FITC, CD25 PE (1/100 dilution; BD Pharmingen), and Foxp3 (eBioscience) were used for the histological staining. For TGF-β staining, a 1D11 Ab was used as the primary Ab (1/100 dilution; Genzyme) and a goat anti-mouse Texas Red Ab was used as the secondary Ab (1/400 dilution; Santa Cruz Biotechnology). Nuclei were counterstained with Hoechst 33342 dye (Sigma-Aldrich). Sections were viewed under a confocal microscope. BALB/c mice were injected with 1 × 106 RENCA cells i.v. via the tail vein. Five mice received a neutralizing Ab against TGF-β 1D11; five mice received control IgG Ab 13C4 (Genzyme) at a loading dose of 100 mg/kg i.p. at the day of the injection; and five mice received no treatment. The experimental and control groups received 1D11 and 13C4, respectively, every 3 days at a dose of 50 mg/kg over a course of a 30-day experiment. Mice were sacrificed at day 30, and lung tissues were fixed with formalin and cut into 4-μm sections for H&E and immunofluorescence staining. Tumor burden was evaluated by counting numbers of tumor metastases of H&E-stained lung tissue sections of each animal. BALB/c mice were challenged with RENCA cells and treated with or without 1D11 or 13C4, as described above. At the end of the experiment, lung tissues from each animal were digested with 150 U/ml collagenase (Sigma-Aldrich) for 1 h at 37°C. After digestion, lung tissues were cut into small pieces, and single-cell suspensions were obtained and filtered through 70- and 40-μm cell strainers (VWR). Lymphocytes were separated using Percoll (Amersham Biosciences). Briefly, cells were pooled from animals in the same group and resuspended in 8 ml of 40% Percoll and loaded onto 3 ml of 70% Percoll in a 15-ml centrifuge tube. Tubes were spun at 2500 rpm for 20 min at room temperature, and the interface (lymphocytes) was removed using a 3-ml syringe with a 20-gauge needle. Cells were washed three times with PBS to remove the Percoll. CD4+CD25+ T cells were isolated from enriched lung lymphocytes using MACS (Miltenyi Biotec), according to the manufacturer’s instructions. The purity of isolated cell populations was ≥90%, as determined by FACS. Mean ± SD are given. For comparison of groups, the one-way ANOVA with posttest comparison was performed, and a p < 0.05 was considered significant. Since Woo et al. (31) observed increased Treg cells in peripheral blood in patients with non-small cell lung tumor than the normal donors in 2001, there have been numerous studies that reported a high frequency of Treg cells in peripheral blood in various human cancers (13, 15, 32, 33). A recent study by Curiel et al. (11) reported the presence of CD4+CD25+, Foxp3+CD3+ T cells in human ovarian carcinoma. In an attempt to explore this phenomenon and potential connections between tumors and Treg cells, we used a mouse prostate cancer cell line TRAMP-C2 in this study. To examine whether CD4+CD25+ and Foxp3+ T cells are also present in TRAMP-C2 tumors, lung tissues from mice receiving TRAMP-C2 i.v. were used for immunofluorescence studies. CD4+CD25+ T cells were detected in the metastatic tumor sites in lung tissues from these mice (Fig. 1⇓A). More importantly, Foxp3+CD25+ T cells were also detected at the tumor sites (Fig. 1⇓B). Because Foxp3 is exclusively expressed by Treg cells (22), the positive staining of Foxp3 at tumor sites suggests these cells are Treg cells. It has been shown in other studies that the presence of such CD4+CD25+Foxp3+ Treg cells in tumor sites is associated with suppression of antitumor immunity; however, the origin of these cells remains elusive. In the following studies, we explored the connections between tumor cells and Treg cells and the possible origin of such Treg cells in the tumor mass. CD4+CD25+ and Foxp3+ T cells present within the tumor mass. TRAMP-C2 cells (1 × 106) were injected into C57BL/6 mice i.v. via tail vein. Mice were sacrificed at day 30, lung tissues were fixed in formalin and cut into 4-μm sections, and slides were used to stain for CD4, CD25 (A), and Foxp3 (B) expression and viewed under a confocal microscope. A representative section is shown here. A, CD4+CD25+ T cells in the tumor mass. Red color indicates CD25+ T cells; green, CD4+ T cells; and double-positive T cells are shown as yellow. B, CD25+Foxp3+ T cells in the tumor mass. Foxp3+ T cells are shown in green. Tumor nuclei were counterstained with Hoechst 33342 dye and are shown as blue. Scale bars, 20 μm. Treg cells are developed in thymus or induced and differentiated in the periphery, such as in the tumor microenvironment (34, 35, 36, 37). It has been shown that tumor-derived cytokines, such as IL-10, TGF-β, and vascular endothelial growth factor, suppress dendritic cell (DC) maturation and function. As a result, these dysfunctional DCs induce differentiation of Treg cells in the tumor site (38, 39). However, it is unknown whether tumor cells can directly induce Treg cell differentiation. To investigate the direct relationship between tumors and Treg cells, TRAMP-C2 cells were used in a coculture with CD4+CD25− T cells isolated from C57BL/6 mice. After a 7-day coculture, T cells were sorted on a FACS sorter according to the cell surface CD25 expression into CD4+CD25+ and CD4+CD25− populations. Because Foxp3 is a crucial transcriptional factor and is exclusively expressed in Treg cells, Foxp3 expression in these cells was examined (22). Total RNA was extracted from individual T cell populations, and RT-PCR was performed using Foxp3-specific primers. Foxp3 expression was observed in control CD4+CD25+ Treg cells (Ctrl 25+) as well as in TRAMP-C2-cocultured CD25+ T cells (Fig. 2⇓A, top panel). In contrast, Foxp3 expression was absent in control CD4+CD25− T cells (Ctrl 25−) or TRAMP-C2-cocultured CD25− T cells (Fig. 2⇓A, top panel). In addition, T cells cultured alone did not express Foxp3 (data not shown). Interestingly, CD4+CD25− T cells cocultured with nontumorigenic rat prostate epithelium NRP-152 cells did not express Foxp3 in either sorted CD25+ or CD25− T cells (Fig. 2⇓A, top panel). Tumor cells convert CD4+CD25− T cells into CD4+CD25+ Foxp3+ T cells. A, TRAMP-C2, but not NRP-152 cells induce CD4+CD25+Foxp3+ T cells. Top panel, Isolated CD4+CD25− T cells were cocultured with TRAMP-C2 and NRP-152 cells and sorted, as described in Materials and Methods. A two-step RT-PCR was performed to detect Foxp3 expression. Bottom panel, Isolated CD4+CD25− T cells were cultured in TRAMP-C2 and NRP-152 CM, as described in C, and expression of Foxp3 was detected by RT-PCR. B, Kinetics of conversion of CD4+CD25− T cells into CD4+CD25+ T cells. Top panel, Rate of conversion. Isolated CD4+CD25− T cells were cocultured with TRAMP-C2 cells for 0–5 days and T cells were analyzed by FACS. Bottom panel, Ratio of conversion. T cells were cocultured with TRAMP-C2 at different ratio for 5 days, and percentage of CD4+CD25+ T cells was analyzed by FACS. C, Schematic drawing of the experimental design. TRAMP-C2 cells were cultured for 3 days and CM was collected. On the same day, CD4+CD25− T cells were isolated and cultured with CM. Five days later, T cells were collected and phenotype analyses were conducted to characterize these T cells. D, Intracellular staining of Foxp3. CD4+CD25− T cells were cultured, as described in C, and protein levels of Foxp3 were measured by intracellular staining and analyzed by FACS, according to the manufacturer’s protocol. Top panel, Shows the intracellular Foxp3 expression of Ctrl 25+ and Ctrl 25− T cells. Bottom panel, Shows the intracellular Foxp3 expressions of T cells cultured with T cell medium or TRAMP-C2 CM. Isotype control rat IgG2a is shown as gray area. E, The dilution effect of TRAMP-C2 CM on conversion of CD4+CD25− T cells. CD4+CD25− T cells were cultured with TRAMP-C2 CM diluted at various concentrations for 5 days, and percentage of CD4+CD25+ T cells was analyzed by FACS and a graph representation is shown at the bottom. All conditions were performed in triplicate and reported as the mean ± SD. All results shown are representative of at least three independent experiments. Next, the kinetics of conversion was examined. To study the rate of conversion, TRMAP-C2 cells were cocultured with purified CD4+CD25− T cells as above for 0–5 days, and T cells were collected on each day and analyzed by FACS for CD25 expression levels. As shown in Fig. 2⇑B, top panel, the percentage of CD4+CD25+ T cells increased in a time-dependent manner. In addition, the ratio of conversion was studied by coculturing TRAMP-C2 and CD4+CD25− T cells at 0:1, 0.1:1, 0.25:1, 0.5:1, 0.75:1, and 1:1 for 5 days. At the end of the 5-day culture, T cells were collected and cell surface CD25 expression was analyzed by FACS. The percentage of CD4+CD25+ T cells increased in a ratio-dependent manner (Fig. 2⇑B, bottom panel). 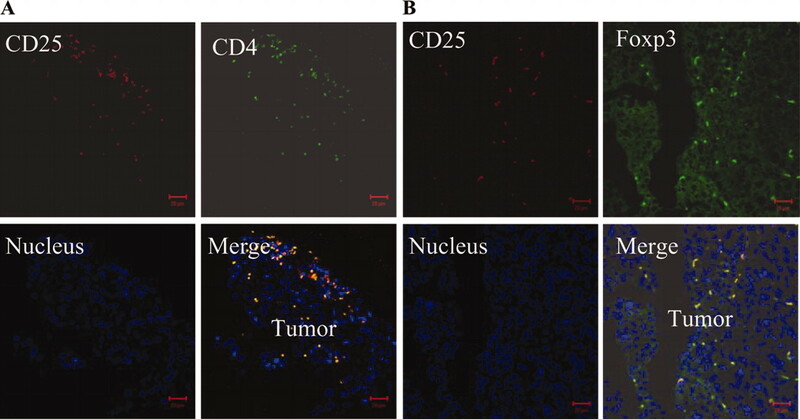 These results suggest that coculture of purified CD4+CD25− T cells with tumor cells TRAMP-C2, but not nontumorigenic NRP-152 cells, induces CD4+CD25+Foxp3+ T cells. Moreover, these results provide evidence that tumor cells can indeed directly convert CD4+CD25− T cells into Treg cells. To investigate whether cell-cell contact between tumor and T cells was required for the induction of Foxp3-expressing T cells, TRAMP-C2 CM was used to culture these T cells. Fig. 2⇑C delineates the experimental design. CM was collected after a 3-day culture of TRAMP-C2 cells. On the same day, purified CD4+CD25− T cells were cultured in CM. Five days later, Foxp3 expression was examined in these T cells by RT-PCR. Of note, the T cells cultured with CM were not sorted because >85% of cultured CD4+ T cells are CD25 positive (Fig. 2⇑E). Both Ctrl 25+ and T cells cultured with TRAMP-C2 CM expressed Foxp3 (Fig. 2⇑A, bottom panel). However, Foxp3 expression was absent in Ctrl 25− or CD4+CD25− T cells cultured in T cell medium (Ctrl) (Fig. 2⇑A, bottom panel). Again, CD4+CD25− T cells cultured with NRP-152 CM did not express Foxp3 (Fig. 2⇑A, bottom panel). In addition, protein expression of Foxp3 was evaluated by intracellular staining using an Ab against Foxp3 and analyzed by FACS (Fig. 2⇑D). In agreement with RT-PCR results, FACS analysis demonstrated increased protein expression levels of Foxp3 in T cells cultured in TRAMP-C2 CM (CM) as the Ctrl 25+; however, CD4+CD25− T cells cultured with T cell medium (Ctrl) did not express Foxp3 (Fig. 2⇑D, bottom panel). To study the dilution effect of CM on the conversion, 0.01, 0.1, 0.25, 0.5, and 0.9 ml of TRAMP-C2 CM were diluted in T cell medium in a final volume of 1 ml. Purified CD4+CD25− T cells were cultured in the various diluted CM for 5 days and analyzed by FACS to examine CD25 expression levels. Fig. 2⇑E shows a representative FACS profile of the conversion. The starting purified CD4+CD25− T cell population is shown as day 0. The graph on the bottom represents the percentage of CD4+CD25+ T cells cultured in various diluted CM. The results suggest the conversion of CD4+CD25− T cells into CD4+CD25+ T cells is in a CM concentration-dependent manner. Taken together, these results indicate that cell-cell contact is not required because TRAMP-C2 CM was sufficient to generate Foxp3-expressing T cells, and this conversion is in a CM concentration-dependent manner. In addition, because Foxp3 is exclusively expressed in Treg cells, results from this study suggest that TRAMP-C2 cell CM, but not NRP-152 CM, can generate Treg cells from CD4+CD25− T cells. All of the following experiments were conducted with CM. Treg cells differ from other T cells in that they have been shown to predominantly secrete IL-10 or TGF-β, but not IL-2 (22, 40). To examine whether T cells cultured with TRAMP-C2 CM shared the same characteristics as naturally occurring Treg cells, cytokine production profile of these T cells was evaluated. CD4+CD25− T cells were cultured in CM for 5 days and restimulated for 48 h, at which time IL-2 and IL-10 production were assayed, or 72 h, when TGF-β was measured. Supernatant was collected from various T cell cultures, and cytokine production profile of these cells was evaluated using ELISA. As a comparison, the cytokine production profile of naturally occurring CD4+CD25+ Treg cells (Ctrl 25+) and control CD4+CD25− T cells (Ctrl 25−) is shown as insets in each graph. T cells cultured with TRAMP-C2 CM (CM) produced virtually nondetectable amounts of IL-2, whereas T cells cultured with T cell medium (Ctrl) produced high levels of IL-2 (Fig. 3⇓A). In addition, T cells cultured with CM produced high levels of IL-10 and TGF-β as compared with T cells cultured with T cell medium (Fig. 3⇓, B and C). These results revealed that T cells cultured with CM have a similar cytokine production profile to naturally occurring Treg cells, and these similarities provided evidence to further support the notion that tumor cells convert CD4+CD25− T cells to Treg cells (22, 40). Cytokine production profile of T cells cultured with TRAMP-C2 CM. 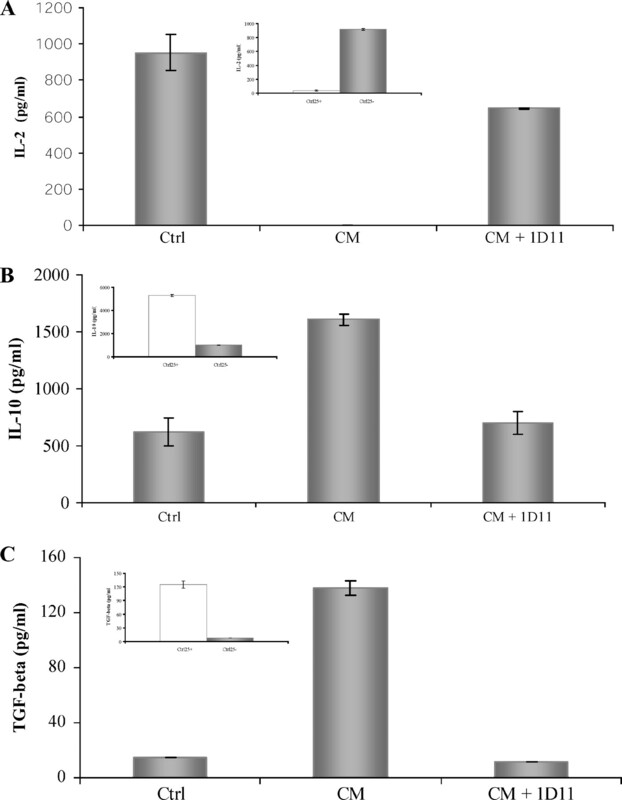 CD4+CD25− T cells were cultured with TRAMP-C2 CM for 5 days and restimulated for either 48 h to measure levels of IL-2 (A) and IL-10 (B), or 72 h for TGF-β (C), as described in Materials and Methods. Insets, Show the cytokine production profile of Ctrl 25+ and Ctrl 25− T cells. Ctrl 25+ is shown as □, and Ctrl 25− is shown as ▦. All conditions were performed in triplicate and reported as the mean ± SD. All results shown are representative of at least three independent experiments. Next, the suppressive ability of T cells cultured with CM was examined in an in vitro functional assay. In this study, CM was collected from tumor cells RENCA and TRAMP-C2, irradiated TRAMP-C2, and nontumorigenic rat epithelium cells NRP-152 and was used to culture isolated CD4+CD25− T cells for 5 days. At the end of a 5-day culture, freshly isolated CD4+CD25− T cells were stimulated with anti-CD3 Ab and APCs and cultured with various T cell populations for 72 h, and cell proliferation was measured by [3H]thymidine incorporation. When cultured alone, T cells cultured with CM derived from tumor cells TRAMP-C2 or RENCA (CM) did not proliferate (Fig. 4⇓, A, C, and D). Interestingly, T cells cultured with CM derived from nontumorigenic NRP-152 cells (CM) proliferated vigorously when stimulated with anti-CD3 Ab (Fig. 4⇓B). To examine their suppressive ability for CD4+CD25− responder T cell proliferation/activation, suppression assays were performed using different CM T cell:CD4+CD25− T cell ratios. Freshly isolated CD4+CD25− T cells (1.5 × 104) were cultured with individual T cell populations cultured with various CM (5 × 104). 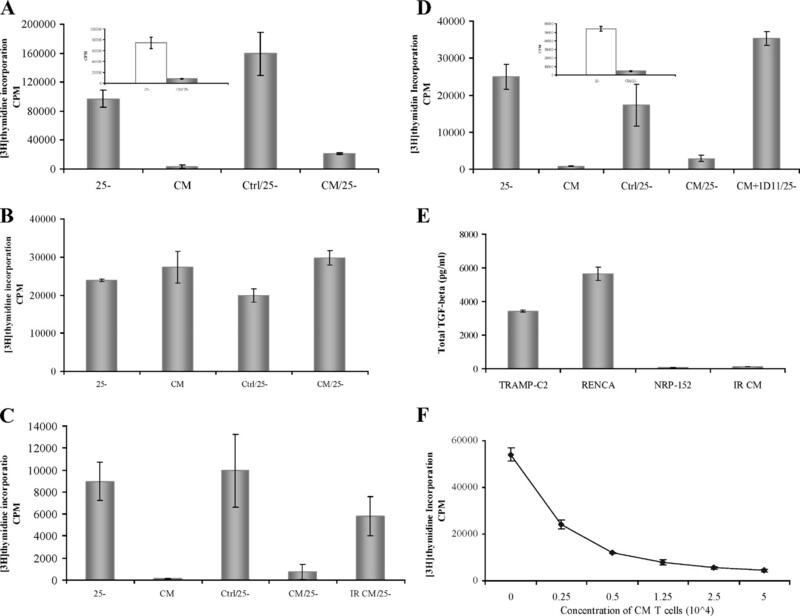 T cells cultured with CM derived from tumor cells TRAMP-C2 or RENCA (CM/25−) suppressed CD4+CD25− T cell proliferation, whereas T cells cultured with T cell medium (Ctrl/25−) did not (Fig. 4⇓, A, C, and D). In addition, when tumor CM T cells were cultured with freshly isolated CD4+CD25− T cells at 1:1 ratio (5 × 104), CM T cells demonstrated a potent suppressive ability (Fig. 4⇓, A and D, insets). However, T cells cultured with CM from a nontumor cell line NRP-152 (CM/25−) were unable to suppress CD4+CD25− T cell proliferation (Fig. 4⇓B). Furthermore, a titration assay was performed. In this study, 5 × 104 freshly isolated CD4+CD25− T cells were stimulated with anti-CD3 Ab and cultured with different numbers of TRAMP-C2 CM-cultured T cells ranging from 0 to 5 × 104. CM T cells showed a potent suppressive ability of CD4+CD25− T cell proliferation in a dose-dependent manner (Fig. 4⇓F). These results strongly suggest that tumor cells, but not nontumorigenic cells, can indeed directly convert CD4+CD25− T cells into Treg cells because these T cells demonstrated a potent suppressive ability in the in vitro suppression assay. CM from tumor cells, but not nontumorigenic cells, converts CD4+CD25− T cells to anergic/suppressor T cells. CD4+CD25− T cells were cultured with CM from various cell lines for 5 days. A total of 1.5 × 104 freshly isolated CD4+CD25− responder T cells was stimulated with anti-CD3 and APCs in the absence (CD25− T cells alone) or presence of T cells cultured with various CM (5 × 104) to examine their suppressive ability for responder T cell activation. A, Suppression assay of T cells cultured with RENCA CM. Inset, 5 × 104 CD4+CD25− responder T cells were either cultured alone or with 5 × 104 T cells cultured with RENCA CM. □, Represents CD25− T cells cultured alone, and ▦, with CM T cells. B, Suppression assay of T cells cultured with NRP-152 CM. C, Suppression assay of T cells cultured with irradiated TRAMP-C2 CM. D, Effects of addition of 1D11 on suppressive ability of T cells cultured with TRAMP-C2 CM. Inset, 5 × 104 CD4+CD25− responder T cells were either cultured alone or with 5 × 104 T cells cultured with TRAMP-C2 CM. □, Represents CD25− T cells cultured alone, and ▦, with CM T cells. E, TGF-β ELISA. CM was collected from various cells, and TGF-β production was measured by ELISA. F, Titration of T cells cultured with TRAMP-C2 CM. A total of 5 × 104 CD4+CD25− responder T cells was stimulated with anti-CD3 and APCs with various concentrations of TRAMP-C2 CM T cells to examine the titration effect on their suppressive ability. All conditions were performed in triplicate and reported as the mean ± SD. All results shown are representative of at least three independent experiments. Many types of tumor cells produce high levels of TGF-β, and exogenously added TGF-β can convert CD4+CD25− T cells into Treg cells (35, 41, 42, 43). Consequently, levels of TGF-β present in the CM from RENCA, TRAMP-C2, irradiated TRAMP-C2, and NPR-152 cells were examined using a TGF-β ELISA. The results indicated that tumor cells produced high levels of TGF-β, whereas the nontumorigenic NRP-152 and irradiated TRAMP-C2 cells had significantly lower TGF-β production (Fig. 4⇑E). To elucidate the mechanism of Treg cell conversion and the potential role of tumor-derived TGF-β, a neutralizing Ab against TGF-β 1D11 was used. This Ab recognizes TGF-β1, 2, and 3 in human and mouse and neutralizes biological activities of TGF-β (44). When 1D11 was added to TRAMP-C2 CM, T cells cultured with CM did not express Fopx3 (Fig. 2⇑A, bottom panel). In addition, T cells cultured with NRP-152 CM did not express Foxp3 because NRP-152 CM had little TGF-β expression (Fig. 4⇑E). Furthermore, neutralization of TGF-β completely changed the profile of cytokine production of these T cells, and cells now expressed high levels of IL-2 and low levels of IL-10 and TGF-β (Fig. 3⇑). More importantly, in the suppression assay, addition of 1D11 abrogated the ability of TRAMP-C2 CM-cultured T cells to suppress CD4+CD25− T cell proliferation (Fig. 4⇑D). Finally, CD4+CD25− T cells were cultured with irradiated TRAMP-C2 CM, because TGF-β production was significantly reduced in irradiated CM (Fig. 4⇑E). As shown in Fig. 4⇑C, the resulting T cells were unable to suppress CD4+CD25− T cell proliferation. Taken together, these results have revealed a critical role of tumor-derived TGF-β in conversion of CD4+CD25− T cells into Treg cells. Noticeably, nontumorigenic NRP-152 cells produce low levels of TGF-β (Fig. 4⇑E) (45), and T cells cultured with CM derived from these cells were unable to suppress T cell proliferation (Fig. 4⇑B). Collectively, these studies demonstrate that tumor cells convert CD4+CD25− T cells into Treg cells through the production of high levels of TGF-β, whereas nontumorigenic cells NRP-152 and irradiated TRAMP-C2 were unable to convert such cells due to the low levels of TGF-β production. To support the above in vitro observations, an in vivo study was conducted using the mouse renal cell carcinoma RENCA because they produce high levels of TGF-β (Fig. 4⇑E). BALB/c mice were injected with 1 × 106 RENCA cells i.v. via the tail vein. On the day of injection, five mice received 1D11 and five mice received control Ab13C4 at a loading dose of 100 mg/kg. These mice continued receiving 1D11 or 13C4 at a dose of 50 mg/kg every 3 days for a course of 30 days. At the end of the experiment, all animals were sacrificed, TGF-β levels were measured in serum and lung tissues, and tumor burden was evaluated in all animals. TGF-β ELISA revealed that serum levels of TGF-β were significantly reduced in 1D11-treated animals, whereas serum from untreated and 13C4-treated animals contained levels of TGF-β that were comparable to those of tumor-free animals (Fig. 5⇓A and data not shown). In addition, TGF-β expression in lung tissues was evaluated. Lung sections from animals were stained with an anti-TGF-β Ab. Fig. 5⇓B shows the TGF-β expression profile of these animals. In tumor-bearing mice receiving 13C4 or no treatment, TGF-β was ubiquitously expressed in tumor and lung tissues, whereas no TGF-β expression was detected in lung tissues of mice receiving 1D11. Analysis of tumor burden revealed that animals receiving 1D11 had substantially fewer tumor metastases in the lung tissues as compared with those receiving 13C4 or no treatment (Fig. 5⇓, C and D). 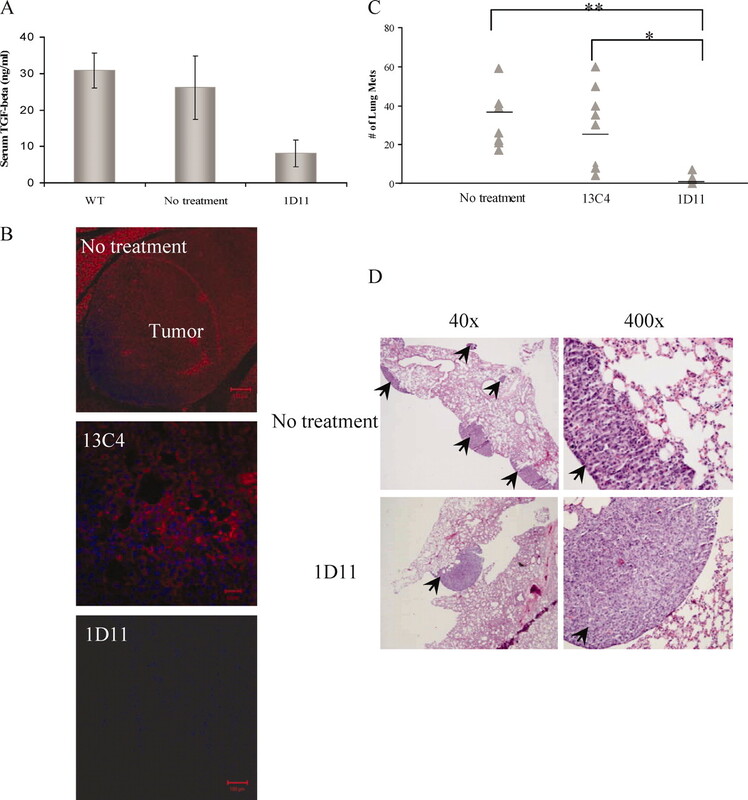 These results demonstrate the efficacy of 1D11 in neutralizing TGF-β in treated animals, and such treatment reduces the tumor burden. Neutralization of TGF-β with 1D11 reduces lung metastases. BALB/c mice were challenged with RENCA cells and treated with or without 1D11 or 13C4, as described in Materials and Methods. A, Serum TGF-β ELISA. B, Immunofluorescence staining of TGF-β in lung tissues. Red color indicates the positive staining of TGF-β, and blue, nuclei. Scale bars: top and bottom panels, 100 μm, and middle panel, 20 μm. C, Numbers of lung metastases. Lung metastases were counted in H & E-stained lung sections, and the number of lung metastases of each mouse was plotted. The graph represents pooled data from two independent experiments. Each dot represents one animal, and the lines represent the mean. ∗, p < 0.05; ∗∗, p < 0.01 using one-way ANOVA with posttest comparison. D, H & E staining of lung tissues from tumor-bearing animals. A representative staining section is shown in this figure. Arrows indicate lung metastases. Many types of tumors produce high levels of TGF-β (41, 42, 43). Because TGF-β is a potent immunosuppressant, high levels of tumor-derived TGF-β could impair immune responses against tumor cells, conferring tumor growth advantage (46). Therefore, removal of tumor-derived TGF-β could facilitate tumor rejection by the host immune system. Indeed, as shown in Fig. 5⇑, C and D, animals receiving 1D11 had a reduced tumor burden as compared with animals receiving control Ab 13C4 and no treatment. One mechanism by which tumor cells might evade the immune system is through conversion of tumor-infiltrating CD4+ T cells into Treg cells. To test this hypothesis, phenotype of T cells isolated from lung tissues from different treatment groups was examined. Lymphocytes were enriched, as described in Materials and Methods, and percentage of CD4+CD25+ T cells was analyzed by FACS. As shown in Fig. 6⇓A, all animals receiving different treatments had similar percentage of CD4+CD25+ T cells in their lung tissues. However, immunofluorescence staining revealed that Foxp3 expression was absent in animals receiving 1D11 and present in animals receiving no treatment or control Ab 13C4 (Fig. 6⇓A). Moreover, the suppressive ability of CD4+CD25+ T cells from tumor sites in the lung tissues of animals was evaluated. 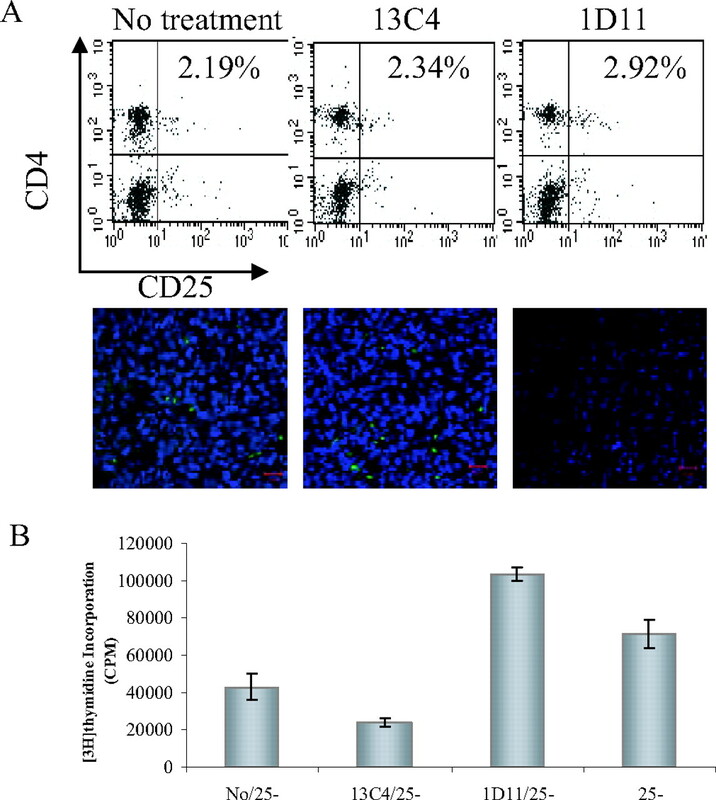 CD4+CD25− T cells were stimulated with anti-CD3 Ab and cultured with CD4+CD25+ T cells isolated from the lung tissues of animals receiving different treatments. CD4+CD25+ T cells from animal receiving no treatment and 13C4 demonstrated suppressive ability when cocultured with CD4+CD25− T cells (Fig. 6⇓B). However, the CD4+CD25+ T cells isolated from animals receiving 1D11 were unable to suppress the CD4+CD25− T cell proliferation (Fig. 6⇓B). These results suggest tumor-derived TGF-β converts CD4+ T cells into CD4+CD25+Foxp3+ Treg cells in the tumor microenvironment and neutralization of TGF-β using 1D11 abolished the conversion. Neutralization of TGF-β abrogates the suppressive ability of CD4+CD25+ T cells from lung tissues of tumor-bearing animals. A, Foxp3+ T cells are absent in the tumor mass of animals receiving 1D11. T lymphocytes were separated from the lung tissue of animals receiving different treatments, and percentage of CD4+CD25+ T cells in lung tissues was analyzed by FACS (top panel). Bottom panel, Shows a representative staining pattern for Foxp3+ cells in the tumor mass. Fopx3+ T cells are shown in green, and nuclei are shown in blue. Scare bars, 20 μm. B, Neutralization of TGF-β abrogates suppressive ability of CD4+CD25+ T cells from the lung tissues. A total of 5 × 104 freshly isolated responder CD4+CD25− T cells was stimulated with anti-CD3 Ab and APCs in the absence or presence of CD4+CD25+ T cells isolated from lung tissues of animals receiving different treatment. All conditions were performed in triplicate and reported as the mean ± SD. One of two representative experiments is shown. CD4+CD25+Foxp3+ Treg cells are known for their ability to suppress proliferation of T cells and autoimmunity in animals (16, 17, 18). They are also linked to cancer development, because depletion of Treg cells facilitates tumor rejection (25, 26, 27, 28). Treg cells preferably accumulate in tumor-draining lymph nodes and tumor masses, and the presence of such cells is correlated with a poor prognosis in patients (11, 13, 37). Because depletion of Treg cells is beneficial in tumor rejection in animal studies, identification of the origin of Treg cells in tumor microenvironment will provide valuable information to successfully eliminate Treg cells, and thus the suppression of antitumor immunity by these cells (27, 47, 48). To date, the origin of Treg cells in the tumor microenvironment still remains elusive; however, recent evidence has suggested at least four possible sources of these Treg cells (39). First is trafficking. Tumor cells produce chemokines such as CCL22 that specifically recruits Treg cells to tumor sites (11). Second is differentiation through contacting with tumor-induced immature DCs (38). Third is expansion of Treg cells through DC stimulation (49). Finally, Treg cells can also be converted from normal CD4+ T cells in tumor-bearing animals (37). It appears that there are two distinct types of Treg cells in the tumor microenvironment. One is naturally occurring Treg cells that are either recruited to the tumor sites or stimulated to expand, and the other is through conversion of normal CD4+ T cells into Treg cells. Although the phenotype of these two types of Treg cells is virtually indistinguishable (50), the origin of these Treg cells differs, as described above. TGF-β plays a critical role in extrathymic generation/conversion of Treg cells either through direct or indirect mechanisms. The direct conversion of Treg cells by tumor-derived TGF-β is demonstrated in this study, whereas the indirect mechanism involves induction of immature DCs by tumor-derived TGF-β, which in turn increase Treg cell conversion (38). Because neither direct expansion of naturally occurring Treg cells by DCs nor trafficking of such cells to the tumor microenvironment requires TGF-β (11, 49), and because a direct treatment with TGF-β induces Treg cell conversion and neutralization of TGF-β reduced Treg cells in the tumor microenvironment (Fig. 6⇑), it is logical to reason that CD4+CD25+Foxp3+ Treg cells observed in the tumor masses, at least some of them, are converted by tumor-produced TGF-β. In addition, they possess suppressive ability of immune cells, thus conferring tumors’ advantage to evade the immune system. T cells obtained from the in vitro conversion studies are bona fide Treg cells in terms of Foxp3 expression, cytokine production (low IL-2, high IL-10, and TGF-β), and suppression of CD4+CD25− T cells (Figs. 2–4⇑⇑⇑). Additional studies revealed a critical role of TGF-β in the conversion because tumor cells (TRAMP-C2 and RENCA) produce high levels of this cytokine, and neutralization of TGF-β completely abrogated the conversion of CD4+CD25− T cells to Treg cells (Figs. 2–4⇑⇑⇑). The importance of TGF-β in conversion was further demonstrated by the studies of CD4+CD25− T cells cultured in CM derived from a nontumorigenic cell line NRP-152 and irradiated TRAMP-C2, because these cells lack all the characteristics of Treg cells due to the absence of TGF-β in CM (Figs. 2–4⇑⇑⇑). Tumor cells are a rich source of TGF-β in the tumor microenvironment, and tumor-derived TGF-β becomes a source that influences conversion of normal CD4+ T cells into Treg cells. Indeed, studies by Kretschmer et al. (51) have demonstrated that addition of TGF-β enhances the conversion of naive CD4+ T cells into Treg cells when stimulated by a minute Ag dose with suboptimal DC activation. The present study suggests that Treg cells in the tumor sites, at least some of them, are converted from normal CD4+ T cells by tumor-derived TGF-β. We thus propose that tumor cells evade the immune system by conversion of Treg cells through production of high levels of TGF-β. When tumor-infiltrating CD4+ T cells are exposed to TGF-β-rich environment in tumor sites, CD4+CD25+Foxp3+ Treg cell conversion occurs. As a result, the converted Treg cells suppress antitumor immunity, conferring tumor cell advantages to evade the immune system. Indeed, a significant reduction in lung metastases was observed in tumor-bearing animals treated with a neutralizing Ab against TGF-β 1D11 (Fig. 5⇑, C and D). This reduction in tumor burden, at least in part, was due to the absence of CD4+CD25+Foxp3+ Treg cells in the tumor microenvironment of these animals (Fig. 6⇑A). The absence of Foxp3+ Treg cells is most likely due to the lack of conversion of normal CD4+ T cells because of the absence of TGF-β in these animals. Moreover, it is of interest to point out that TGF-β produced by host tissues also could play a role in Treg cell conversion, as demonstrated by Thomas and Massague (52) that blockage of host-produced TGF-β aids tumor rejection. In their studies, mice rejected tumor cells engineered to produce a soluble form of TGF-β type II receptor that systemically neutralizes TGF-β, whereas mice injected with tumor cells producing minimal levels of TGF-β eventually succumbed to tumor burden, suggesting host-produced TGF-β could also play an important role in tumor rejection and as an alternative source of TGF-β in Treg cell conversion. The present and other recent studies have revealed various sources of Treg cells present in the tumor microenvironment. However, the possibility still remains that Treg cells observed in the tumor mass in the present study, at least some of them, were recruited by tumor-derived CCL22, as demonstrated by Curiel et al. (11). It is likely that the population of Treg cells present in the tumor microenvironment consists of a heterogeneous mixture of naturally occurring Treg cells and converted Treg cells. Cytokines produced by tumor cells, such as CCL22, IL-10, and TGF-β, can work in concert to aid tumors in evading the immune system, either by recruitment of naturally occurring Treg cells to tumor sites or through direct or indirect conversion of normal CD4+ T cells to Treg cells (11, 37, 38, 39). Furthermore, it has been shown that functional CD4+CD25+ Treg cells can be expanded by DCs (49). Finally, Treg cell conversion could also occur independent of TGF-β, as shown in the study by Kretschmer et al. (51) that T cells with Ag specificity can be efficiently induced to Treg cells with minute amount of Ag stimulation along with suboptimal DC activation. However, addition of TGF-β further enhances such conversion. It appears that extrathymic generation/conversion of Treg cells could be Ag specific or nonspecific; in either case, TGF-β plays an essential role in this conversion. It is therefore important to identify the source of Treg cells in the tumor mass to provide a better understanding and more efficient measurement in treatment of existing tumors, as depletion of CD25+ T cells will not prevent the conversion of normal CD4+ T cells into Treg cells by tumor cells. Combination of CD25+ T cell depletion and blockage of TGF-β should further improve the outcome of treatment of existing tumors. However, because TGF-β is a very potent immunosuppressant, long-term systematic blockage of TGF-β may result in autoimmunity in patients; therefore, it is critical to find the delicate balance between tumor immunity and autoimmunity that is maintained by Treg cells in the treatment of tumors. In summary, this study provides evidence that tumor cells can directly convert normal CD4+ T cells into CD4+CD25+Foxp3+ Treg cells through production of TGF-β, thus providing a possible mechanism whereby tumors evade the host immune surveillance program through conversion of Treg cells. We thank Dr. Mary Paniagua and Jeffrey Nelson for assistance with flow cytometry, Dr. Adam Kohm for assistance with T cell proliferation assay, and Dr. Teng-Leong Chew for assistance with microscopy. ↵2 Abbreviations used in this paper: TIL, tumor-infiltrating lymphocyte; CM, conditioned medium; DC, dendritic cell; Treg, T regulatory. Burnet, F. M.. 1970. The concept of immunological surveillance. Prog. Exp. Tumor Res. 13: 1-27. Rosenberg, S. A.. 2001. Progress in the development of immunotherapy for the treatment of patients with cancer. J. Intern. Med. 250: 462-475. Rosenberg, S. A., J. R. Yannelli, J. C. Yang, S. L. Topalian, D. J. Schwartzentruber, J. S. Weber, D. R. Parkinson, C. A. Seipp, J. H. Einhorn, D. E. White. 1994. Treatment of patients with metastatic melanoma with autologous tumor-infiltrating lymphocytes and interleukin 2. J. Natl. Cancer Inst. 86: 1159-1166. Boon, T., P. van der Bruggen. 1996. Human tumor antigens recognized by T lymphocytes. J. Exp. Med. 183: 725-729. Dudley, M. E., J. R. Wunderlich, P. F. Robbins, J. C. Yang, P. Hwu, D. J. Schwartzentruber, S. L. Topalian, R. Sherry, N. P. Restifo, A. M. Hubicki, et al 2002. Cancer regression and autoimmunity in patients after clonal repopulation with antitumor lymphocytes. Science 298: 850-854. Zhang, L., J. R. Conejo-Garcia, D. Katsaros, P. A. Gimotty, M. Massobrio, G. Regnani, A. Makrigiannakis, H. Gray, K. Schlienger, M. N. Liebman, et al 2003. Intratumoral T cells, recurrence, and survival in epithelial ovarian cancer. N. Engl. J. Med. 348: 203-213. Clemente, C. G., M. C. Mihm, Jr, R. Bufalino, S. Zurrida, P. Collini, N. Cascinelli. 1996. Prognostic value of tumor infiltrating lymphocytes in the vertical growth phase of primary cutaneous melanoma. Cancer 77: 1303-1310. Clark, W. H., Jr, D. E. Elder, D. Guerry, IV, L. E. Braitman, B. J. Trock, D. Schultz, M. Synnestvedt, A. C. Halpern. 1989. Model predicting survival in stage I melanoma based on tumor progression. J. Natl. Cancer Inst. 81: 1893-1904. Nakano, O., M. Sato, Y. Naito, K. Suzuki, S. Orikasa, M. Aizawa, Y. Suzuki, I. Shintaku, H. Nagura, H. Ohtani. 2001. Proliferative activity of intratumoral CD8+ T-lymphocytes as a prognostic factor in human renal cell carcinoma: clinicopathologic demonstration of antitumor immunity. Cancer Res. 61: 5132-5136. Schumacher, K., W. Haensch, C. Roefzaad, P.M. Schlag. 2001. Prognostic significance of activated CD8+ T cell infiltrations within esophageal carcinomas. Cancer Res. 61: 3932-3936. Sasada, T., M. Kimura, Y. Yoshida, M. Kanai, A. Takabayashi. 2003. CD4+CD25+ regulatory T cells in patients with gastrointestinal malignancies: possible involvement of regulatory T cells in disease progression. Cancer 98: 1089-1099. Marshall, N. A., L. E. Christie, L. R. Munro, D. J. Culligan, P. W. Johnston, R. N. Barker, M. A. Vickers. 2004. Immunosuppressive regulatory T cells are abundant in the reactive lymphocytes of Hodgkin lymphoma. Blood 103: 1755-1762. Liyanage, U. K., T. T. Moore, H. G. Joo, Y. Tanaka, V. Herrmann, G. Doherty, J. A. Drebin, S. M. Strasberg, T. J. Eberlein, P. S. Goedegebuure, D. C. Linehan. 2002. Prevalence of regulatory T cells is increased in peripheral blood and tumor microenvironment of patients with pancreas or breast adenocarcinoma. J. Immunol. 169: 2756-2761. Suri-Payer, E., H. Cantor. 2001. Differential cytokine requirements for regulation of autoimmune gastritis and colitis by CD4+CD25+ T cells. J. Autoimmun. 16: 115-123. Seddon, B., D. Mason. 1999. Regulatory T cells in the control of autoimmunity: the essential role of transforming growth factor β and interleukin 4 in the prevention of autoimmune thyroiditis in rats by peripheral CD4+CD45RC− cells and CD4+CD8− thymocytes. J. Exp. Med. 189: 279-288. Asseman, C., S. Mauze, M. W. Leach, R. L. Coffman, F. Powrie. 1999. An essential role for interleukin 10 in the function of regulatory T cells that inhibit intestinal inflammation. J. Exp. Med. 190: 995-1004. Murakami, M., A. Sakamoto, J. Bender, J. Kappler, P. Marrack. 2002. CD25+CD4+ T cells contribute to the control of memory CD8+ T cells. Proc. Natl. Acad. Sci. USA 99: 8832-8837. Read, S., V. Malmstrom, F. Powrie. 2000. Cytotoxic T lymphocyte-associated antigen 4 plays an essential role in the function of CD25+CD4+ regulatory cells that control intestinal inflammation. J. Exp. Med. 192: 295-302. Tanaka, H., J. Tanaka, J. Kjaergaard, S. Shu. 2002. Depletion of CD4+ CD25+ regulatory cells augments the generation of specific immune T cells in tumor-draining lymph nodes. J. Immunother. 25: 207-217. Akbar, A. N., L. S. Taams, M. Salmon, M. Vukmanovic-Stejic. 2003. The peripheral generation of CD4+ CD25+ regulatory T cells. Immunology 109: 319-325. Woo, E. Y., H. Yeh, C. S. Chu, K. Schlienger, R. G. Carroll, J. L. Riley, L. R. Kaiser, C. H. June. 2002. Cutting edge: regulatory T cells from lung cancer patients directly inhibit autologous T cell proliferation. J. Immunol. 168: 4272-4276. Woo, E. Y., C. S. Chu, T. J. Goletz, K. Schlienger, H. Yeh, G. Coukos, S. C. Rubin, L. R. Kaiser, C. H. June. 2001. Regulatory CD4+CD25+ T cells in tumors from patients with early-stage non-small cell lung cancer and late-stage ovarian cancer. Cancer Res. 61: 4766-4772. Ormandy, L. A., T. Hillemann, H. Wedemeyer, M. P. Manns, T. F. Greten, F. Korangy. 2005. Increased populations of regulatory T cells in peripheral blood of patients with hepatocellular carcinoma. Cancer Res. 65: 2457-2464. Wolf, A. M., D. Wolf, M. Steurer, G. Gastl, E. Gunsilius, B. Grubeck-Loebenstein. 2003. Increase of regulatory T cells in the peripheral blood of cancer patients. Clin. Cancer Res. 9: 606-612. Valzasina, B., S. Piconese, C. Guiducci, M. P. Colombo. 2006. Tumor-induced expansion of regulatory T cells by conversion of CD4+CD25− lymphocytes is thymus and proliferation independent. Cancer Res. 66: 4488-4495. Ghiringhelli, F., P. E. Puig, S. Roux, A. Parcellier, E. Schmitt, E. Solary, G. Kroemer, F. Martin, B. Chauffert, L. Zitvogel. 2005. Tumor cells convert immature myeloid dendritic cells into TGF-β-secreting cells inducing CD4+CD25+ regulatory T cell proliferation. J. Exp. Med. 202: 919-929. Zou, W.. 2006. Regulatory T cells, tumor immunity and immunotherapy. Nat. Rev. Immunol. 6: 295-307. Chen, T. C., D. R. Hinton, V. W. Yong, F. M. Hofman. 1997. TGF-B2 and soluble p55 TNFR modulate VCAM-1 expression in glioma cells and brain derived endothelial cells. J. Neuroimmunol. 73: 155-161. Kong, F. M., M. K. Washington, R. L. Jirtle, M. S. Anscher. 1996. Plasma transforming growth factor-β1 reflects disease status in patients with lung cancer after radiotherapy: a possible tumor marker. Lung Cancer 16: 47-59. Xu, J., A. Ahmad, J. F. Jones, R. Dolcetti, E. Vaccher, U. Prasad, J. Menezes. 2000. Elevated serum transforming growth factor β1 levels in Epstein-Barr virus-associated diseases and their correlation with virus-specific immunoglobulin A (IgA) and IgM. J. Virol. 74: 2443-2446. Dasch, J. R., D. R. Pace, W. Waegell, D. Inenaga, L. Ellingsworth. 1989. Monoclonal antibodies recognizing transforming growth factor-β: bioactivity neutralization and transforming growth factor β2 affinity purification. J. Immunol. 142: 1536-1541. Danielpour, D.. 1999. Transdifferentiation of NRP-152 rat prostatic basal epithelial cells toward a luminal phenotype: regulation by glucocorticoid, insulin-like growth factor-I and transforming growth factor-β. J. Cell Sci. 112: 169-179. Letterio, J. J., A. B. Roberts. 1998. Regulation of immune responses by TGF-β. Annu. Rev. Immunol. 16: 137-161. Steitz, J., J. Bruck, J. Lenz, J. Knop, T. Tuting. 2001. Depletion of CD25+ CD4+ T cells and treatment with tyrosinase-related protein 2-transduced dendritic cells enhance the interferon α-induced, CD8+ T-cell-dependent immune defense of B16 melanoma. Cancer Res. 61: 8643-8646. Yamazaki, S., T. Iyoda, K. Tarbell, K. Olson, K. Velinzon, K. Inaba, R. M. Steinman. 2003. Direct expansion of functional CD25+CD4+ regulatory T cells by antigen-processing dendritic cells. J. Exp. Med. 198: 235-247. Wing, K., Z. Fehervari, S. Sakaguchi. 2006. Emerging possibilities in the development and function of regulatory T cells. Int. Immunol. 18: 991-1000. Thomas, D. A., J. Massague. 2005. TGF-β directly targets cytotoxic T cell functions during tumor evasion of immune surveillance. Cancer Cells 8: 369-380. Gershon, R. K., K. Kondo. 1970. Cell interactions in the induction of tolerance: the role of thymic lymphocytes. Immunology 18: 723-737. Gershon, R. K., K. Kondo. 1971. Infectious immunological tolerance. Immunology 21: 903-914.